The trust carried out a preliminary survey last year, but it did not uncover the factory site. However, it said test results from 2007 proved that picrite had been mined in an area known locally as Cwm Mawr, and a study in the 1950s had suggested it was an area where axes had been made. Archaeologist Mr Martin added: "The axes are more commonly found in the border areas and the West Midlands, but they have been found throughout Britain, as far apart as Devon and Cornwall and the north of England. 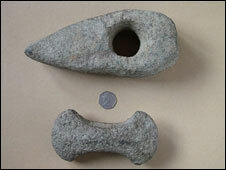 "As the axes have been found around Britain it suggests they were exported in quite large numbers. "As for their uses, we're not sure if the axes were used to split logs or split heads or just used for ceremonial duties." Mr Martin said they were fairly distinctive because they were made of a certain type of picrite rock, which could be traced back to the Cwm Mawr area. "We assume that quite a few people worked at the site and in terms of the Bronze Age it could have been quite a big industrial centre," he said.